The Velar's roots are firmly planted deep within the Jaguar Land Rover group. Back in 1969 when Land Rover kick-started the Range Rover project, the first decoys that ran around as test mules were called Velar to conceal the brand and product. And now Range Rover has brought that badge back. Except this time it's not pretending to be someone else. 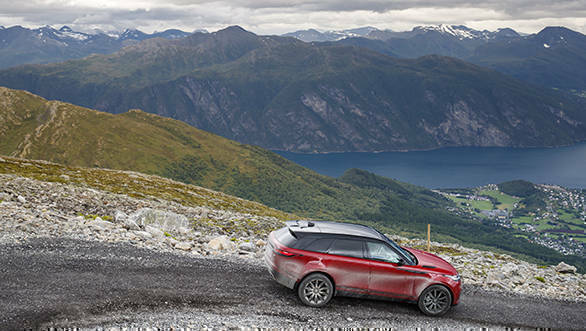 The Velar has a life of its own, its own identity, and going by the drive in Norway, it's going be a life filled with lots of colour! The Velar shares its underpinnings with the Jaguar F-Pace. If you've seen the two, you'd laugh off the notion. The Velar nevertheless carries all the strands of DNA common to every Range Rover, a go-anywhere ability clubbed to outstanding design presence and upmarket style. It's the kind of temptation to sway the strongest will. The Velar nonetheless fills a space between the Evoque and the Range Rover Sport. The exterior hints at ideas borrowed from the Range Rover, the Sport and Evoque. But that's what they are, just ideas. As a young and evolving brand I thinks it is fantastic that Range Rover can still bring a large amount of integrity to an all-new product without upsetting the design ethos it is creating. The skin it wears is chic and sophisticated, with clean strong lines, sharp details and some eye-catching accents. The juxtaposition of each piece with the other creates a flow that is unique and appealing. At the front there is a strength to the design that will be its fast-track ticket to the big league. The side profile is a bit like a spindle, with the swept back design shifting volume from the front towards the centre of the Velar and then tapering out again. That side profile to me is its strongest design attribute. It gives a sense of space where you'd like to see it, just around the cabin, without adding weight to those parts that will be doing the heavy lifting anyway -- the engine and driveline at the front and the rear axle. The rear, while equally good looking with its upswept tail, could have had one revision. The position of the exhaust tips could have been further apart. The dual exhaust ports look too closely bunched up. Adding depth to the overall design are a host of details that are more tech driven than simply design accents. The LED headlamps with the laser matrix for high beams, burnished copper accents on certain trim levels, very fancy deployable door handles that otherwise sit flush with the body work, they all add to the visual drama that is the Velar. The sheen and gloss that allow the Velar to shine on the outside continue to be reflected in the interiors. The combination of white and black leather accents on the seats, the sheer width of the dashboard and the high gloss reflective surfaces of the twin touchscreens drop jaw in amazement. There are options to choose from but the one that is highly recommended is the Kvadrat interior that brings textiles into play. Yup, somehow Range Rover has managed to make fabric cool again, employing it to turn the cabin extravagant. And it's not just the fabric seat highlights, it's the suede cloth that covers the larger areas of the seat whose fibres are made from recyclable plastic that elevates this cabin. Onto the focal point within this cabin, the dual touchscreens on the centre console that've been developed using Panasonic's Magic Dial technology. Part of a movement called 'reduction' within Range Rover, these screens are the sauce that elevates the Velar's meat locker. 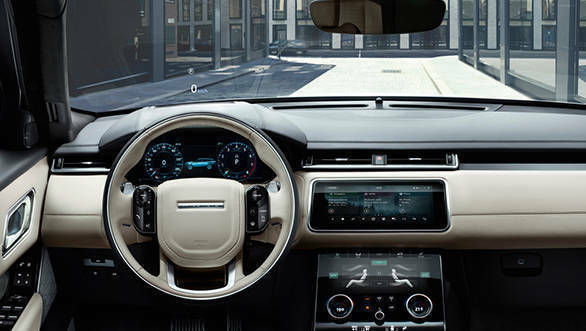 The screens control every known luxury, safety and tractive feature in the Velar without the need for any buttons. Now this isn't something new; the Range Rover had a similar theme as well and back then it was called minimalist design. Old wine, new bottle, but still one of the greats! The LED touchscreens are gorgeous to look at. With high-definition displays and ultra-quick responses, these outdo any known tablet in the market and are a sight better than what you get in the Rangie or the Sport. It takes a little getting used to, like every reduction though, you just give it some time. Interior space is a question mark. 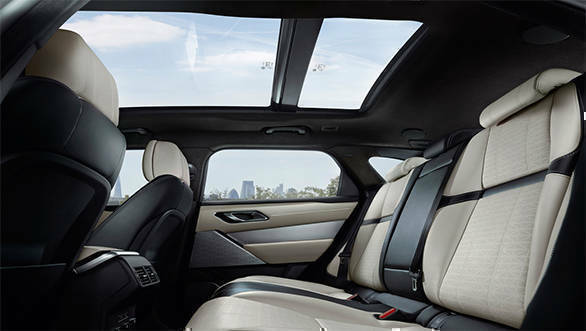 The coupe-like roofline and the plush interiors make the cabin appear smaller than it is. From the outside though the Velar appears like a very long SUV, but at 4,803mm in length it's nearly 500mm shorter than the Range Rover. There is, however, enough space for all the occupants, even those in the rear. Ideally this is a 4-seater. A high and wide transmission tunnel intrudes into the space for the fifth passenger, so it is best to place kids in the seat in-between. At the front, the seats felt heavily bolstered at first, my love handles getting a bit too much love from the grip. This too takes some time to settle into. But the seats are electronically adjustable and I simply loved how the squab area rolls out to provide additional underthigh support. Six engines make up the range offered in the Velar -- three diesels and three petrols. Of these Jaguar Land Rover India will offer the 2-litre 180PS 4-cylinder diesel at the lower end of the range. With a 1,800bar common rail direct injection system, 430NM of max torque and a single variable geometry turbocharger, Land Rover claims the car can get to a 100kmph in 8.9 seconds. That's not too bad but the focus here is on efficiency and claims put mileage figures at roughly around 18kmpl. One step up the ladder resides the P250, a petrol that delivers 250PS from a turbocharged inline 4-cylinder engine. 0-100kmph in 6.7 seconds is achieved thanks to variable valve lift, direct injection and twin scroll turbo. The engine option I did get to drive however and which I believe will command the bulk of sales is the D300, the flagship V6 diesel. With 300PS and an enormous 700Nm of torque, this is one of the most tractable motors Range Rover offers in its fleet. In the Velar, it commands a 0-100kmph time of just 6.1 seconds with a top speed registered at 241kmph. Power delivery is smooth and linear throughout the rev range, but it's the torque peaking between a very narrow rev band (1,500-1,750rpm) that is worth writing home about. Parallel sequential turbos also ensure there is absolutely no turbo lag. It's nothing like the V6 petrol that I also got to sample, which is significantly quicker, but there's enough grunt in the D300 to bring out a healthy smile. And, with a claimed efficiency of around 15.4kmpl in the European combined fuel cycle (an average of both urban and highway mileage readings), it has an accepted amount of sympathy for your wallet. All the engines are configured with an 8-speed automatic transmission, with flappy paddles to control the shifts manually. The Velar also offers selectable driving modes, shifting from Economy to Normal to Dynamic and an individually selectable mode. In the latter you can only shift from Normal to Dynamic mode, and all these can be accessed on the touchscreen. It's a bit confusing at first and not as intuitive as I was led to believe, but it took me just one day to play between the functions to get the hang of it. 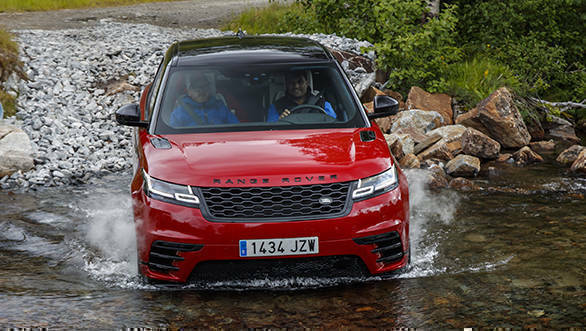 It all boils down to the conditions you are driving in, so off-road you've got a series of driving modes on the terrain response selector, and then you have additional driving modes for tarmac. There certainly is quite a bit to absorb. And I haven't even started on the additional technologies for off-road driving, all of which can be selected on the touchscreen. Diving into the off-road driving modes, I did manage to see what the newest additions bring to the table. 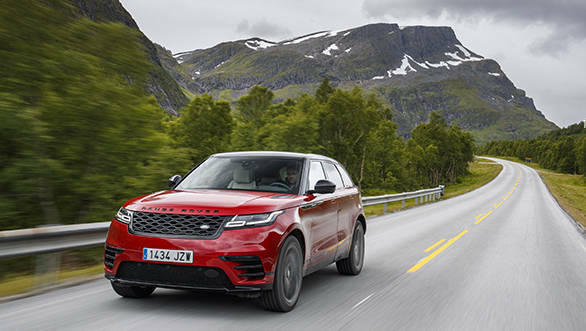 The Velar has the Terrain Response 2 off-road system but packs in some additional technologies just in case terrain response did not make things simple enough for you. For instance, the Velar has got what Range Rover calls ATPC, or All Terrain Progress Control. This is a kind of low-speed cruise control that allows you to simply focus on the steering without having to control the accelerator or brake pedals. The cruise control buttons also help set the desired speed limit. Then there's low-traction launch control that gets the vehicle moving in a higher gear rather than first to minimise wheel spin on slippery surfaces. Hill descent control comes with an additional safety net called gradient release control, which smoothens out the braking effort by progressively releasing the brakes when moving on an incline. The offset of this however is that there is a lot of heat generated in the brakes, and it does get quite smelly. I'm also not willing to buy into the explanations provided about the brakes being very new. Nonetheless the large 350mm ventilated discs at the front and 325mm vented discs at the rear balance out fade and braking efficiency quite well, and on road there is nothing to complain about. The Velar is handsomely capable off-road. It's simply in its genes and there is much it can do with its all-wheel-drive system that would put most other vehicles in its segment to shame. It cannot do as much heavy lifting as its older siblings, the Range Rover Sport and the flagship Range Rover, simply because of its proportions and the ride height it can achieve. But even then, we are talking nickel and pennies here. The adaptive air suspension it sits on ensures that tricky off-road bits get the maximum ground clearance you'd need. Maximum lift is 251mm though standard ride height is set at 213mm. The other interesting bit the adaptive air suspension of the Velar brings in terms of luxury is that the ride height can be dropped by a further 40mm to allow better ingress and egress. I hope the Queen mother is listening! An active locking differential with torque on demand adds more confidence to the Velar's off-road abilities. On tarmac the torque has a 100 per cent bias towards the rear wheels, but can shift to the front wheels or any individual wheel as demanded. Ride quality is impressive, though best left in Comfort mode. With the standard 18-inch wheels and tyres, I expect ride quality will be significantly better than what I experienced in Norway. The air suspension also brings a generous amount of confidence and stability to the Velar's handling character. The steering is linear and quite progressive but can also feel ponderous and emotionless at times. It's best to leave it in Dynamic mode! The Velar will be available in two core ranges -- the Velar and the Velar R-Dynamic. The latter brings stronger accents into play, both on the exteriors and interiors with several luxury features added to the R-Dynamic version. The Velar is expected to be launched in India in September, with deliveries beginning by November. Prices are expected to begin from Rs 75 lakh moving upwards to about Rs 90 lakh. As for the flagship D300, I expect that to peak at around the Rs 1 crore mark. It is a bit steep but there are several choices you can make with 4-5 trim variants under each range, so I expect you could find the right fit. And given the jaw-dropping good looks, the lovely interiors with some stunning equipment on board, and the drivelines to match those good looks, it's an attractive package for those looking for some exclusivity.